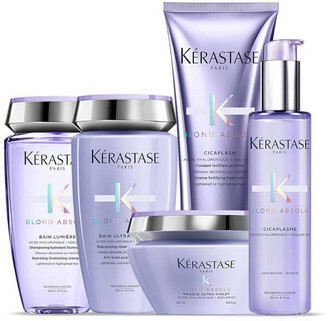 The KÃ©rastase Blond Absolu Bundle combines a selection of five must-have haircare products to keep your blonde hair looking healthy and vibrant. The Set Contains: Blond Absolu Bain LumiÃ¨re Shampoo (250ml) A nourishing cleanser ideal for lightened, highlighted or grey hair. The silky, luxurious formula cleanses strands from root to tip to rid hair of excess oil and impurities, while a hydrating blend of Hyaluronic Acid and Edelweiss Flower replenishes vital moisture. The shampoo delivers powerful antioxidant protection to protect locks against environmental damage, brightening and boosting blonde tones for a vibrant, radiant and healthy-looking finish. Blond Absolu Bain Ultra-Violet Shampoo (250ml) A deeply nourishing treatment that boosts luminosity. The purple shampoo works to deliver lasting protection against brassy and yellow tones, whilst defending against pollution and other external aggressors to maintain a healthy, natural-looking shine. Hyaluronic Acid and Edelweiss Flower work in harmony to melt away dirt and excess oil and replenish hydration, leading to a silky-soft and vibrant head of hair. Blond Absolu Masque Ultra-Violet (200ml) A weekly hair mask for lightened and highlighted locks. The purple formula helps to banish brassy and yellow tones while protecting against dullness caused by pollution and other environmental aggressors. Hyaluronic Acid and Edelweiss Flower combine to deliver high levels of soothing moisture, rebuilding weak hair fibres and infusing strands with a healthy, salon-worthy gloss. Blond Absolu Cicaflash Fondant (250ml) A weightless and luxurious formula that delivers the deep nourishment of a hair mask with the lightweight finish of a conditioner. The shimmery gel has a soft lavender hue and is infused with Hyaluronic Acid and Edelweiss Flower to replenish intense hydration to every strand, rebuilding and strengthening the fibre to minimise breakage. The conditioner helps to create smoother, softer and silkier hair with a radiant finish. Blond Absolu Cicaplasme Treatment (150ml) An intensive, leave-in hair mask that brightens blonde, highlighted and grey hair. The shimmering, lavender-coloured cream coats each strand in a nourishing veil to smooth the hair cuticle and seal split ends in order to tame frizz and flyaways. Enriched with Hyaluronic Acid and Edelweiss Flower to deliver intense hydration, the rich treatment protects hair from temperatures up to 230Â°C while defending against damaging UV rays and pollution. After use, locks feel sleek and supple and are infused with a brilliant shine.